President Lungu says he is firmly in charge of Government to spearhead development across the country. Mr Lungu told residents of Mucheleka village that his administration is working towards enhancing agriculture in rural areas because they are critical in enhancing development. The President was drumming up support for Patriotic Front candidate George Mwamba, who is contesting in the September 24 Lubansenshi parliamentary by-election. 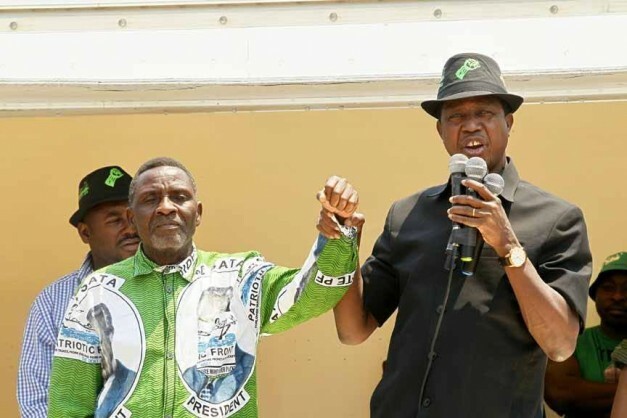 Mr Lungu, who also later addressed a rally at Luwingu’s President’s Park, said the people of Luwingu must not be deceived by some opposition political party leaders claiming they will effectively develop the area. He said his administration will not neglect rural areas but ensure that roads, among other infrastructure, are constructed to improve their livelihoods.Mr Lungu urged the people of Lubansenshi to vote for Mr Mwamba as he is caring and concerned about improving their lives. “Vote for someone who has a heart for you and who is wise and active to remind me about your needs. We do not want people and politics of insults. I want to work with Mr Mwamba because he is someone who listens to your concerns and needs,” he said. He also cautioned the voters in Lubansenshi against being swayed by cash bribes which are reportedly being distributed by a named candidate. And Mr Lungu said his administration means well and wants to work with everyone, including the opposition. He said it is, however, unfortunate that there are attempts to frustrate these efforts by some opposition political parties whose members are “oppressed” once they are appointed as deputy or Cabinet ministers.“I want to work with everyone but the opposition want to oppose everything. Those we want to work with are oppressed. It shouldn’t be like that. They want to oppose everything and everyone. When you are tall they oppose and say no you are short,” said Mr Lungu. President Lungu also reiterated his assurance that Government will soon ensure that the vulnerable people in rural areas benefit from the social cash transfer. And Northern Province Minister Freedom Sikazwe said people must exercise patience with government as it is making efforts to develop the whole country. Mr Sikazwe, who is PF campaign manager in the Lubansenshi by-election, urged the residents in the area to vote for Mr Mwamba. And President Lungu also held a meeting with six Luwingu district chiefs and assured them that Government is on course to bring development to the area as evidenced by the on-going infrastructure development. The President said his administration is committed to building infrastructure such as roads, schools and health facilities to improve lives. Mr Lungu said this in response to the traditional leaders through their representative, Senior Chieftainess Chungu who highlighted some of the challenges people in their chiefdoms are facing. Senior Chieftainess Chungu thanked President Lungu for sparing time to interact with chiefs in the district and urged him to continue engaging traditional leaders more often. “We also appeal to you to consider creating another district to foster development. We are also waiting for the construction of a district hospital and the roads such as the Luwingu-Nsombo, Luwingu-Kasaba and Shimumbi,” she said. She also praised President Lungu for empowering women as evidenced by the appointment Vice-President, Inonge Wina, and others to key decision-making positions. This Lungu is not fit for office. He is lying to the Zambian people. He has no leadership skills, no vision and no brain. Which president have you heard of that falls asleep in office? The man is unwell, and he is going abroad for his treatment which he doesn’t provide for local Zambians. People in rural communities do not have clean water in our modern times, there is poverty among farmers, there is no fuel in cities. Do we want another term with LUNGU VODKA JAMESON? NO…! WE WANT CHANGE AND WE WANT IT NOW..! Zambia is currently collapsing, the whole economy is failing because PF leaders have no clue with financial management skills and managing government resources. Zambians whatever you do, VOTE wisely. Vote for another leader – you do not want to keep PF for another 5 years. You deserve better, your families deserve better lives and jobs. Look around Zambia – after 51 years, people in government are still pointing fingers at one another – they still live in a blame culture. He did it, he must sort it out… she did it when she was in MMD …!The chaos never stops…! VOTE WISELY. Do a favour the future children of Zambia. Look at our neighbouring countries, Botswana is doing better, and it is just a fraction of Zambia. Rwanda a war torn nation is doing better than Zambia. Tanzania, a country that we regarded as low and uneducated, they are doing far better than Zambia, ask yourselves WHY…! Answer is better leadership.. leaders with VISION, LEADERS WHO CARE. VOTE PF OUT OF GOVERNMENT… WE WANT TO DEVELOP ZAMBIA – MAKE A BETTER NATION OUT THIS CHAOS.